If romance is the essence of wine, and wine is the heart of Napa Valley, then Wine + Napa + Wedding Proposal = Pure Perfection. This is probably why people have been getting engaged in Napa for ages. Maybe even since the first winery set up shop here in 1861. But that doesn’t mean your proposal should be cliché. Make this moment utterly and unequivocally YOU by putting your own spin on one of these unique Napa Valley wedding proposals. Everyone loves a good scavenger hunt, especially when it ends with a ring. This idea is highly customizable, but here are some loose guidelines you can follow. 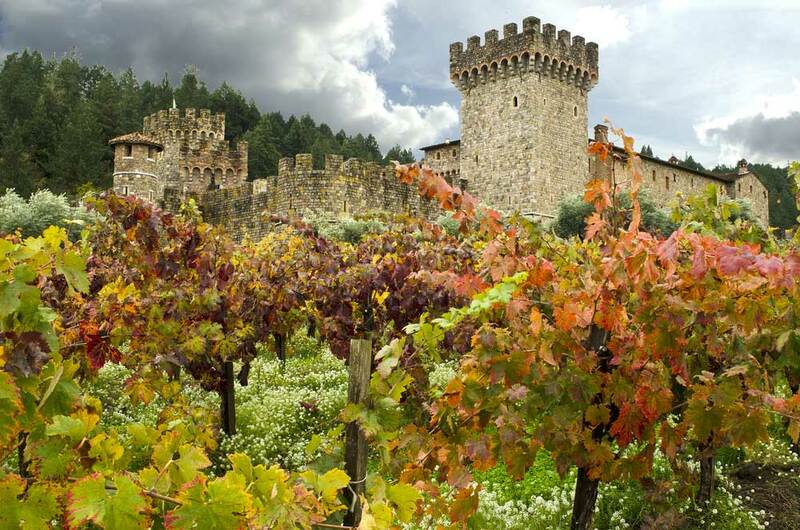 Make plans with your partner to spend the day together touring the Napa Valley. You’ll uncover clues together along the way that will lead you to your next destination. Email clues to someone at each winery you plan to visit. The designated person can read the clue to you and your spouse-to-be when you arrive. Keep a wine journal along the way. This is a moment to be remembered. Save your clues along with wine labels and tasting notes in a wine journal. You can go back and add pictures from the day later. The scavenger hunt in this video sends the bride-to-be on a day of pampering with her good friends and eventually leads her to her proposal. If you choose to go this route, you will likely need to enlist the help of friends or family to keep your partner on task. Picture this. You and your honey are floating above rolling fields and oak-studded hills when you swoop down to get a better look at the “Will You Marry Me?” banner resting in a field. She gasps and looks to you for confirmation that this is real, and really for her. And there you are on bended knee, acting out the romantic story that will be told and retold for years to come. In this sweet video below, you’ll see that this proposal was done with a bit of a sweet twist. It’s all about making the engagement your own. What’s more romantic that a bicycle built for two? How about a moped? Plan out each stop to ensure the day goes off without a hitch, but the real surprise, the ring, will be placed in her helmet before you even set out on your adventure. This video illustrates what it’s like to be behind the wheel of a moped, riding around Napa Valley. It’s beautiful, exhilarating and romantic. Just like your love. If you’re a bit of a prankster, this proposal idea is perfect for you. Here’s how it’s done. Plan to go to dinner at a romantic restaurant, preferably somewhere warm and inviting like Celadon or the French Laundry. But before you go, coordinate your proposal with the staff. Here’s how it’ll go down. Ask the server to take your picture at some point during dinner. This works best with a polaroid, but it can also work with any phone or digital camera. Squeeze close together and smile for the camera. While you’re posing, another server will hold up a “Marry me?” sign behind you. Ideally, the server won’t actually be in the picture. If you’re sitting, he may kneel to hold the sign above your heads. If you’re standing, he may duck and hold the sign up or to the side. Ask your partner to check the picture, or have the waiter ask for you. Imagine her surprise when she sees the well-planned photobomb. As she picks her jaw up off the floor, you will be there presenting her with a ring. Visit the spot with a friend before the big day. Have your friend take pictures of you holding up three signs one at a time. 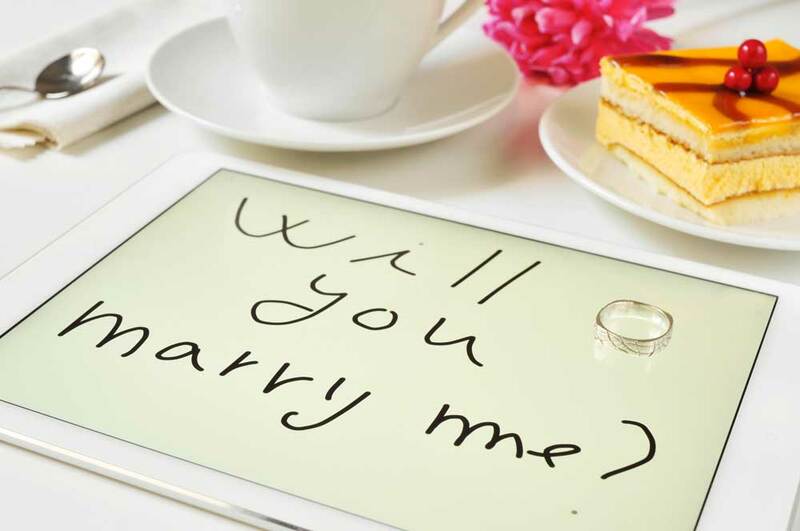 The first says, “Will.” The next says, “you.” And the third “Marry me?” sign is the one that drives your message home. Plan to meet her at this exact spot. When she gets there, text her the images one at a time while you’re standing in a nearby yet out of sight spot. Walk towards her as you text the last image and bend down on one knee before her. Plan to spend the day frolicking through the fields with a kite and the one you love. Get her attention as your kite goes soaring through the air with the words, “Will you marry me?” written on the kite’s underside. Consider this one a more intimate twist on the old sky writing proposal. Sommelier for a day at Raymond Vineyards – Immerse yourself in wine culture while blending your own wine and making your own wine label. Crazy Creek Air Adventures – Take in panoramic views of the Napa Valley as you soar through the air in an exhilarating glider plane ride. Grgich Hills Grape Stomping – If the idea of jumping into a barrel of freshly-picked grapes sounds like fun, you and your partner will love the grape stomping harvest adventure at Grgich Hills. Whether you want your proposal to be one-of-a-kind or just an unforgettable experience, the wine country is the perfect backdrop. Use the ideas here or plan your own uniquely personal event. You really can’t go wrong with a Napa Valley proposal.